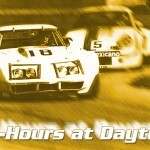 You are here: Home / Featured Corvettes / Introducing the Fifth Generation Corvette! 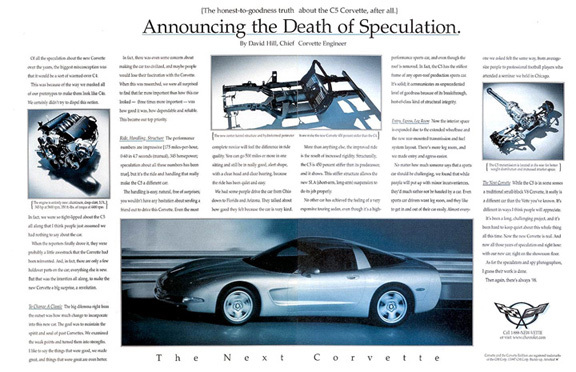 For the C5’s introductory year (1997), Chevrolet was intent on spelling everything out in plain English. 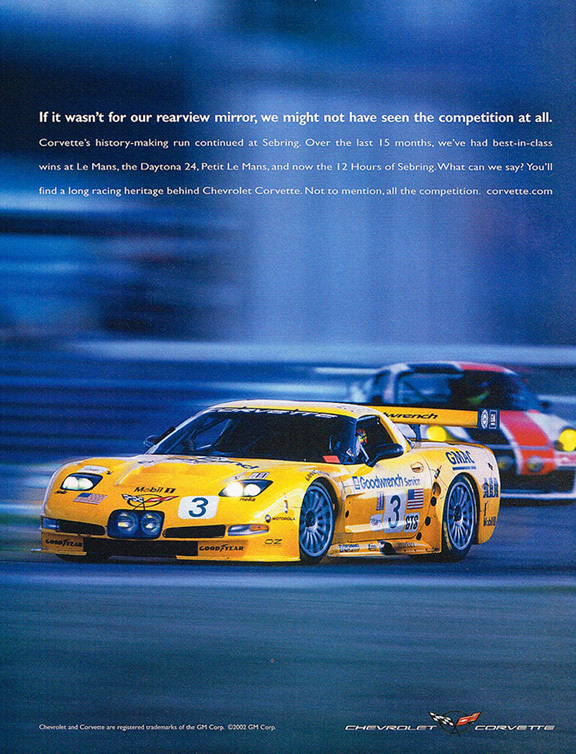 This 2 page spread print ad was written by none other than David Hill, the Chief Corvette Engineer at the time. The very wordy ad touts all the new car’s attributes– from its all-new 5.7L aluminum engine (now rated at 345 hp) to its state-of-the-art hydroformed perimeter frame. 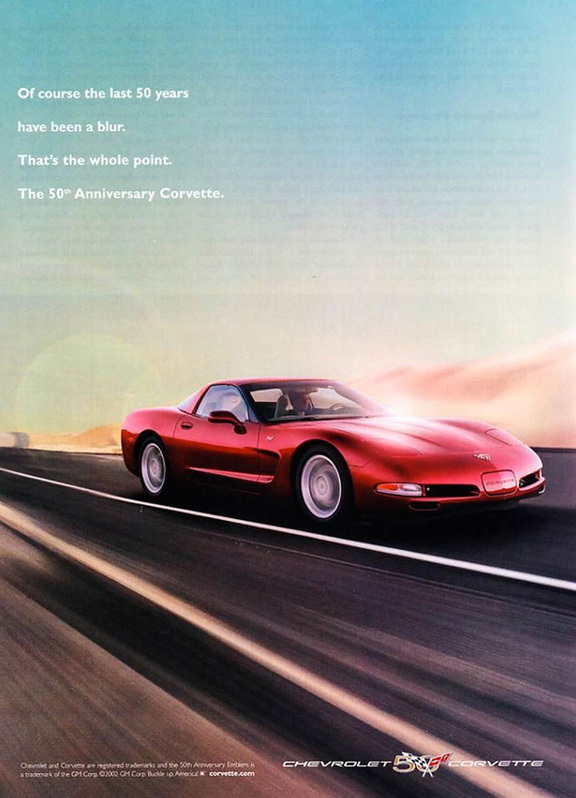 Easy to see why Chevy executed this ad: they “Changed a Classic”, as they state in the ad’s second paragraph. 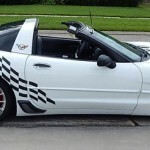 The introduction of the Hardtop Corvette melded nicely with the Coupe and Convertible, flushing out the new line for ’99. 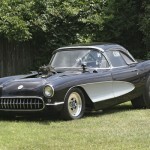 This was Corvette’s lowest priced model, and only 4031 were built. 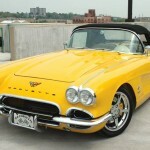 18,078 Coupes and 11,161 Convertibles were produced that year. This print ad goes for bold and simplistic with the heading “The only sports car that matters.” Note the driver wearing a crash helmet. 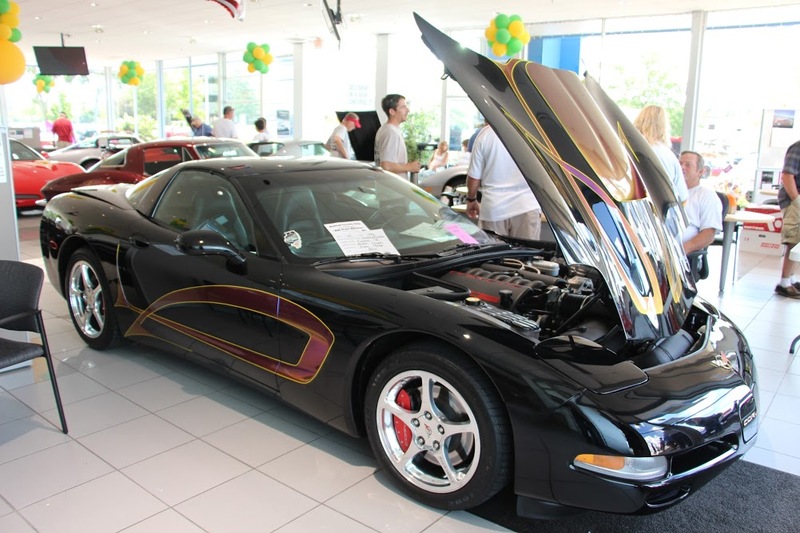 Also noteworthy, in 2001 the Hardtop became the new Z06 model. 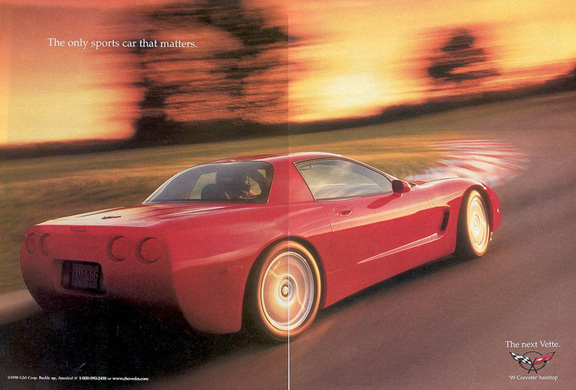 One the most subtle ads for Corvette ever. You could order the special 50th Anniversary package (for the 2003 model year) by requesting the 1SC equipment group– available on Coupes and Convertibles, but not Hardtops. The package included Anniversary Red “Xirallic Crystal” exterior paint, unique front fender emblems, champagne painted aluminum wheels and center caps, and a new Shale interior. These models featured the new F55 Magnetic Selective Ride Control system, which was optional on non-Anniversary Coupes and Convertibles. 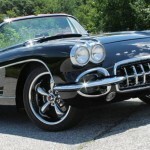 4085 Coupes and 7547 Convertibles were ordered with this special Anniversary package. C5 is the best looking in my opinion. No hard lines and lower than any of the others. My first Corvette was a 1981. Thats’ a 350 cubic inch Engine and 195 Horsepower!! 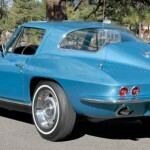 I have just gotten my Second Corvette, a 350 cubic inch Engine and 345 Horsepower!!. The Introduction of the C-5 Generation was as important to the Corvette Dynasty as the C-3. Both introduced many new features. I am happy to say that I am familar with both of them. This is my 1981. See the Similarities?? Picture did not post the first time. Trying again!!!! It is still a nice car, but unfortunately, the electric device for the remote door opening doesn’t function anymore. Chevrolet told me that the respective parts cannot be supplied anymore. This is truly a disadvantage for me. Can anybody help me to solve the situation ? Thank you for any comments. 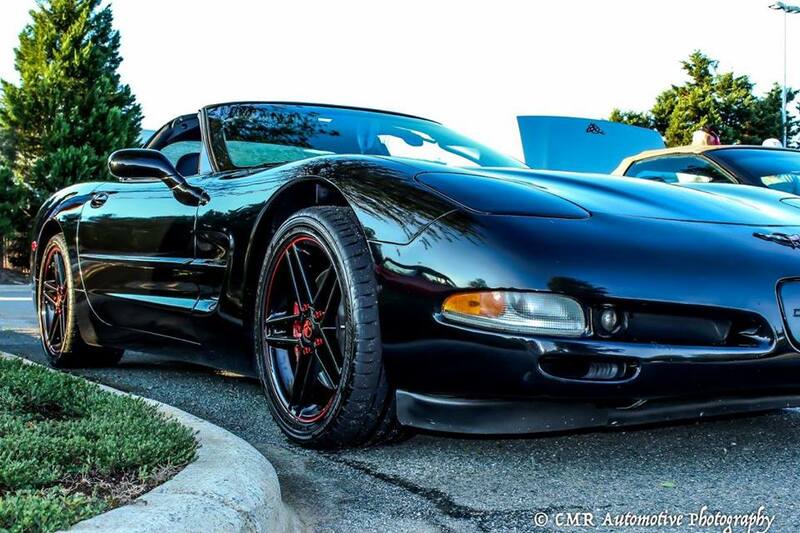 I recently purchased a one owner 2003 50th anniversary convertible.black and black with custom wheels and exhaust.what a head turner the car is gorgues and was never driven in the rain.17,000 miles and it’s like brand new.crazy power.great build corvette.